The Roman Blind offers a classic or contemporary finish to compliment the style of any home. They give you both the privacy, and all the insulating benefits, of drapes. Roman Blinds gather in soft pleats as they open and when fully raised, they give a pelmet-like appearance, adding style and class to your decor. Depending on what you wish to achieve with your Roman Blinds, you can choose from three main fabric options: Blockout, Translucent and Sunscreen. Use the links below for more on these ranges. Looking for easy operation? Automatic Blinds are available in our Blinds range. Window treatments can add a dash of style in your interior space. But if you want something timeless, practical, functional, and beautiful at the same time, you could be better off sticking with roman blinds. Roman blinds have been used for several years now, as old as its name implies. But unlike in the past, you can now have these in varying sizes, types, colours, and materials. What makes roman blinds different from other types of window treatments? This is particularly popular for its unique feature of being raised up or down with the use of a cord. Will never go out of style. Roman blinds can be considered timeless as one of the classical music pieces created by Beethoven. And if you are someone who wants to buy a window treatment that will still be appreciated as long as this is still intact, then roman blinds will live up to this expectation. Can be customized. Is your window too wide? Too narrow? When it comes to window treatments, you can just easily have these customized according to the size you need. On top of that, you can even have these done in material of choice, and then have these done too in your favourite colour! Sun blocking ability. Is the weather too hot to handle and sunshine coming from the windows not helping at all? 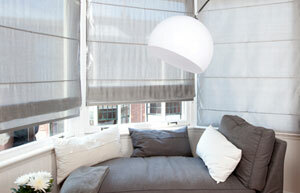 Then with roman blinds installed, all you’ll need to do is lower it down to completely block the pesky rays of the sun. Offers full view. A garden setting or a panoramic view outside is wasted if you do not have full view of it. Don’t you want to see the bright city lights sprawled down from the top floor of your condominium building? Or perhaps that expanse of flower garden just right outside your bedroom window? With roman blinds pulled up, you free your window from obstruction, offering you the best view you could ever have. Can enhance interior design. Gone are the days when roman blinds were flat. Now, you can have these too in teardrop or looped style. This can work well and blend with overall interior design, or you can use this as the room’s focal point of interest. Yes, roman blinds have varied benefits. But these are not for everyone. If your windows are tall, instead of the beautiful view, these may create quite a stack at the top of the window when pulled up. This is not so much of a problem though if you choose to use one that can be rolled in its rail. In humid rooms, these can easily grow mildew on them. That is why you should not use these in bathrooms and kitchens. Roman blinds may be considered an old type of window treatment, but today, this can be fashioned to create a more modern feel. Need someone to help you make your home more beautiful with the use of roman blinds? Then contact us today!